As a new 2014 special edition treat, the plan was to try this before my daughter made her way through the box.... but things didn't quite work out that way. 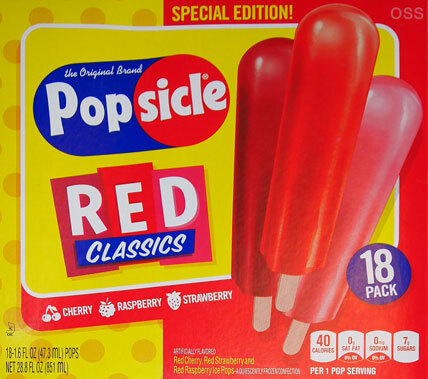 Before I could say "the frozen drink on a stick", she had burned through all the "good" pops in the box. Ahhh ha! She left me two kinds of pops, not just one! On Day #1 I had the redder cherry flavor, but on Day #2 and #3, I had the darker, blecky raspberry flavor! HAHAHA. I thought I was going crazy for a second. Good thing I had one left of each to help straighten things out. So, cherry is fine, but the raspberry? Not so much. Ok, that was quick. Suffice it to say I won't be buying these again. I mean what's the point if my daughter eats all the watermelon ones, I eat the cherry ones, and then the raspberry ones go to waste. I thing we'll stick with the traditional box next time [nope, too late, see already emptied that box too].